The Czech mission to Egypt from the Czech Institute of Egyptology of the Charles University in Prague, Faculty of Arts has discovered a court of a princess from ca 2500 B.C. 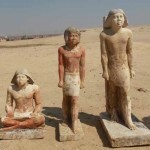 “By this unique discovery we open a completely new chapter in the history of Abusir and Saqqara necropolis” said Miroslav Bárta, director of the mission. The preliminary date of the structure, based on the stratigraphy of the site and analysis of the name, falls in the second half of the Fifth Dynasty. 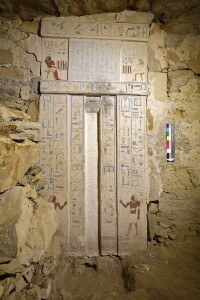 It is surprising that the court should be located in Abusir South, in the south part of the necropolis, i.e. 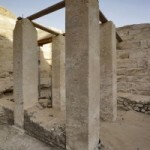 among the tombs of non-royal officials, considering that most members of the Fifth Dynasty royal family are buried ca 2 km north, in the central field of Abusir, or further south in Saqqara. A corridor runs from the south-east corner of the court towards the east. The south wall of the court and of the corridor contains entrances to four rock-cut tombs. Two tombs in the south wall of the court have been explored so far; they appear to belong to high officials: the chief of justice of the Great House, Shepespuptah, and an inspector of the palace attendants by the name of Duaptah. Both tombs probably date to the reign of Djedkare Isesi. 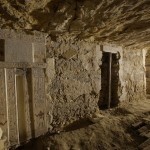 The other two tombs, situated in the corridor, are currently explored by the mission. 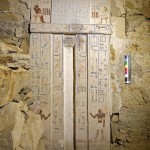 The easternmost tomb belongs to the overseer of the scribes of the crews Nefer, whose false-door is still in his tomb in situ. 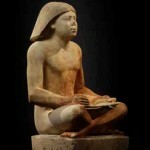 It also contains a serdab, in which four statues of the owner were found, one of them showing him as a scribe. The owner of the fourth tomb was an official Ity. 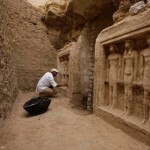 Three large naoi with engaged statues have so far been found in the eastern corridor, placed between the tombs’ entrances. They were sculpted of limestone; small traces of the original polychromy survived. The three naoi contained a statue of a man, statues of a man with his son, and statues of two men with a woman, respectively. All the statues show excellent quality craftsmanship. In addition to that, several fragments of a false-door have been uncovered which bear parts of the titles and the name of the king’s daughter Sheretnebty. “We are very fortunate to have this new window through which we can go back in time and to follow and document step by step life and death of several historically important individuals of the great pyramid age era”, told Miroslav Barta, the head of the Czech mission, at the start of this season. The Czech mission is currently continuing investigation of the site, expecting further surprising discoveries.